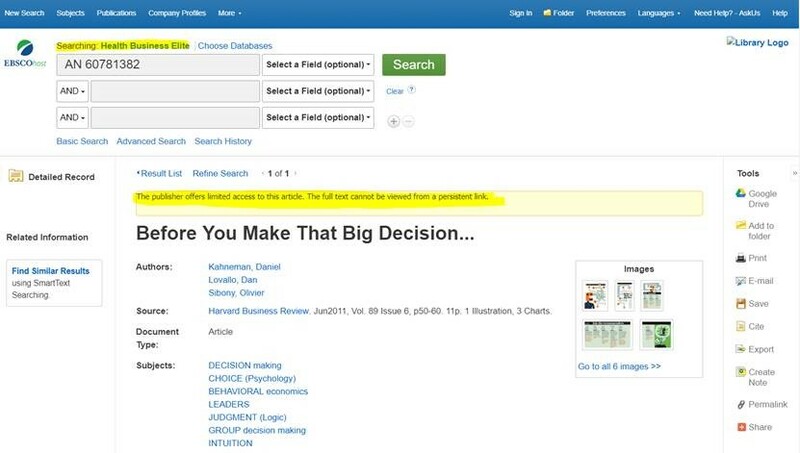 Why can't I access full-text HBR articles in the Health Business Elite database? Please be aware that you may encounter issues when trying to access Harvard Business Review articles within Ebsco’s Health Business Elite database. Issues may be encountered for the attached list of 500 articles. Below is an example of an article that has access restrictions. Any students that require access to full-text articles will need to go directly to Ebsco's Business Source Complete database (there is a direct link to Business Source Complete from the Library eResources page - linked below). Via Business Source Complete, you will be able to search and retrieve the full-text of the 500 restricted Harvard Business Review titles. Example below.